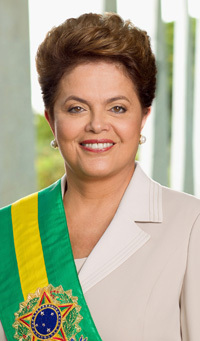 President Dilma Vana Rousseff of Brazil) is the 36th and current president of Brazil.Born on Dec. 14, 1947 she is the first woman to hold the office in Brazil. On July 11, 2014 the Brazilian federal government decided against selling monopolies on interstate mass transportation to selected companies. The government was trying to pick companies to operate along several routes, but the procedure, started in August 2013 and supposed to finish in January 2014, was suspended by several judicial injunctions and predictably marred by bureaucracy. It might not look like much, but at least it signals that the government is somewhat responsive to real life circumstances. In June, President Dilma Rousseff sanctioned a law that modified the model of authorization for interstate highway transportation. Thus, instead of selling off pre-determined routes to specific companies, the government is finally saying that it will allow all comers to operate routes of their creation, provided they meet minimum security and quality standards (which will be decided by the state, of course, but it is a step in the right direction). The government having backpedaled from their own attempts to further regulate people’s travel was the last breath of the idea, floating around since 2008, that they should be selling interstate highway travel routes. The natural tendency would be for the state to keep the current crony capitalist system regulated by its centralized bureaucracy, but such a system has its limits. The government has its back against the wall because of very unfavorable circumstances and the inability to justify such an inefficient and expensive system. But not all is fine and dandy under the new model: Companies will still be able to manipulate the system and exert influence over the minimum requisites of security and quality of service and there will be a cap on ticket prices for 5 years. Cronyism hasn’t been completely purged, but there’s a little more breathing room now. The state has a limit to its actions and there are circumstances in which nothing is left to it but to give in to reality’s pressure and give up its bureaucratic control. Several thinkers have examined about this subject. Jeffrey Tucker, for instance, has talked about technologies and practices that allow us to route around the state. Innovation is essential to back the government up against the corner. David Friedman has mentioned that an ideal stateless society can only work when voluntary institution gradually replace government hierarchies, in such a way that the state is made obsolete. Crypto-anarchy and the expansion of private legal and policing arrangements can and already do play an significant role in achieving that. In that vein, Kevin Carson has also noted that we need to revert the secular process by which central states have suppressed self-management alternatives. We should strive to re-build these alternative social institutions. Compare these ideas to the protests we witnessed last year in Brazil, when thousands of Brazilians took the streets to pressure the government into not raising bus fares. Those protests were far less effective than the circumstances themselves that made the government back off from its proposals to further cartelize the interstate system. One of the reasons for that, of course, is that many activists demanded even more state control over the urban transportation infrastructure, which is the problem in the first place. The result, in several cities, was a temporary freeze of bus fares, but the maintenance of a corporate system that benefits only a few capitalists and politicians. The protests fizzled out and the protesters themselves mostly didn’t remember that there are underground transportation services available in several large cities in the country. After the protests, we saw that to change our transportation system, we have to take from the state what it has taken from us. The people have to provide transportation through voluntary associations and free exchange, because the state will never back off unless its power is made unsustainable. The above writer, Valdenor Junior, is a contributing author at the Center for a Stateless Society (c4ss.org).